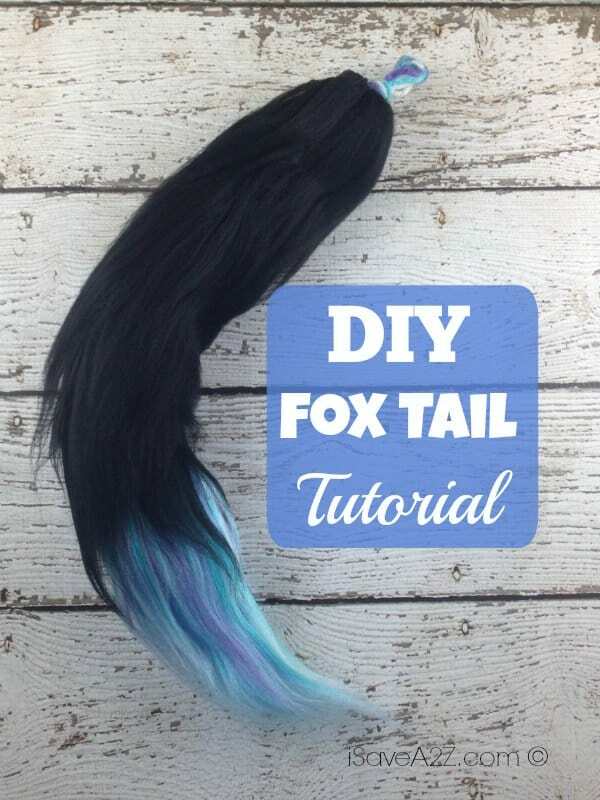 Check out this easy DIY Fox Tail Tutorial that will take you through all of the steps into making your very own fox tail! The materials are anything but expensive, and anyone should be able to make this on their own! I make it in a way that it is super duper soft to touch. Not all are made this way but I have a special trick that I share below. Be sure to check out our DIY Wolf Tail Tutorial too. It’s been a popular craft since the beginning. The process is basically the same but you can see a slightly different technique and different colors. Oh how I love the different color combinations you can make! First, here are the materials that you will need. Now before you start, you want to figure out about how long you want your tail to be when it’s finished. Take that measurement, and measure out about 12 pieces of yarn of that size. The color of this yarn should be the color you want for the tip of the tail. NOTE: If you want your tail to come out thicker, then double the pieces of yarn you use here. 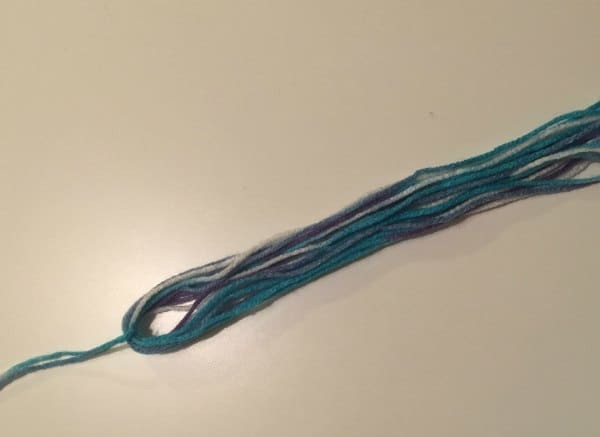 With these pieces of yarn, you are going to want to take one end, and tie them all together in a knot. Once the knot is tight, take three sections of these pieces and braid them all the way down. Knot them at the other end as well. This will serve as the base for your tail. At the bottom of your tail, where you made your second knot, there should be some yarn hanging out of the knot. DON’T CUT IT! Instead, take your pet brush, and start brushing it out. Brush it as if you were brushing hair that is really knotted together. 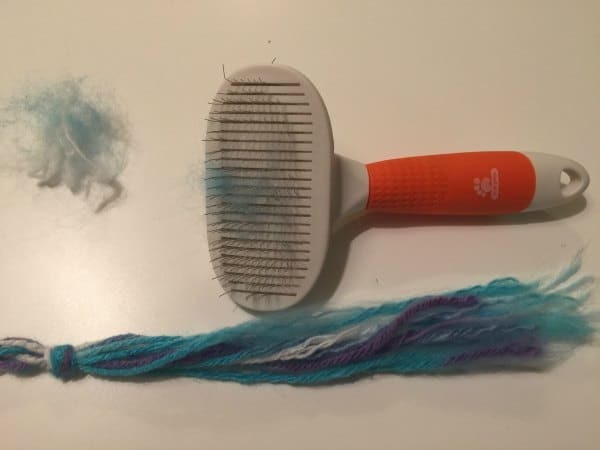 Once it seems as if each fiber of the yarn is untangled, take your hair straightener and straighten the yarn fibers. This should keep it from being so frizzy, but now it will look really gross and compressed. Take your pet brush to it a couple more times, and it should be perfect. Pro Tip: This pet brush works amazing! If you don’t have a good pet brush it will take you a lot longer to create this effect. It would be worth it to get a good brush, especially if you plan on making a few. Now from here on out, we are going to be working from the bottom up. Go back to your yarn, and cut out about 10 pieces at about 8in in length. 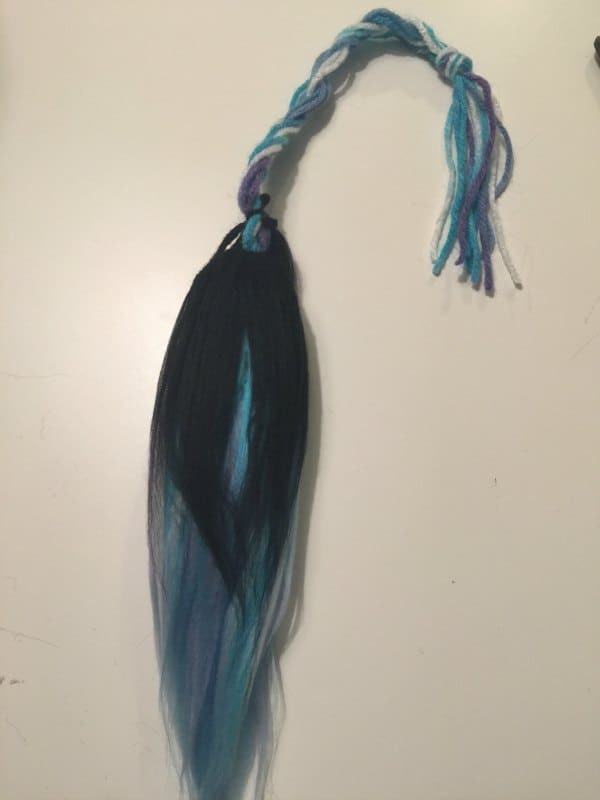 Then another piece at about 5 inches, or long enough to tie around the base of the tail. 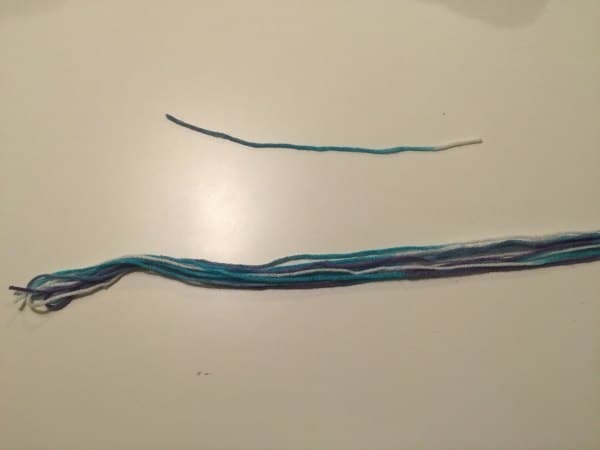 Take the 10 pieces of yarn and place them equally together. 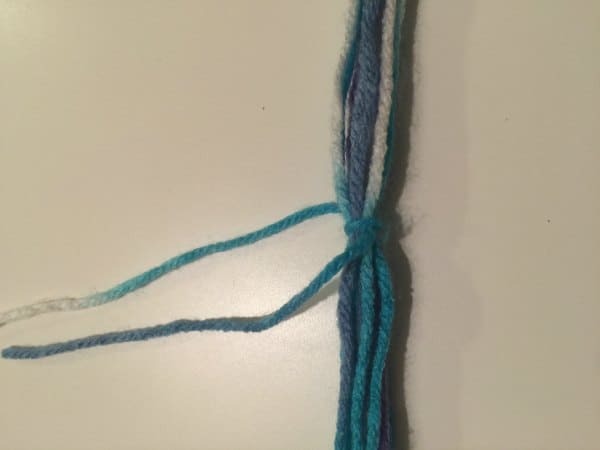 Find the center of these pieces, and take the 5in piece of yarn, and make a knot around your bundle of 8in pieces. Make sure the knot is as tight as it can be. Now, just like you did the tip of your tail, take the ends of the 8in pieces of yarn that had been tied together, and brush them out. Make sure you hold on tightly to where you made your knot! The closer parts to the knot don’t really need to be brushed out as well as the bottom, since this part will be hidden, so make sure you can hold on to each of these pieces near the knot to keep them from slipping out. Use the same brushing and straightening process that you did for the tip of your tail base. NOTE: There will be tons of fluff leftovers! When you start brushing, a lot of fluff will be left on your brush. That’s okay! Make sure you have a trashcan near you, because you will drown in the fluff otherwise! 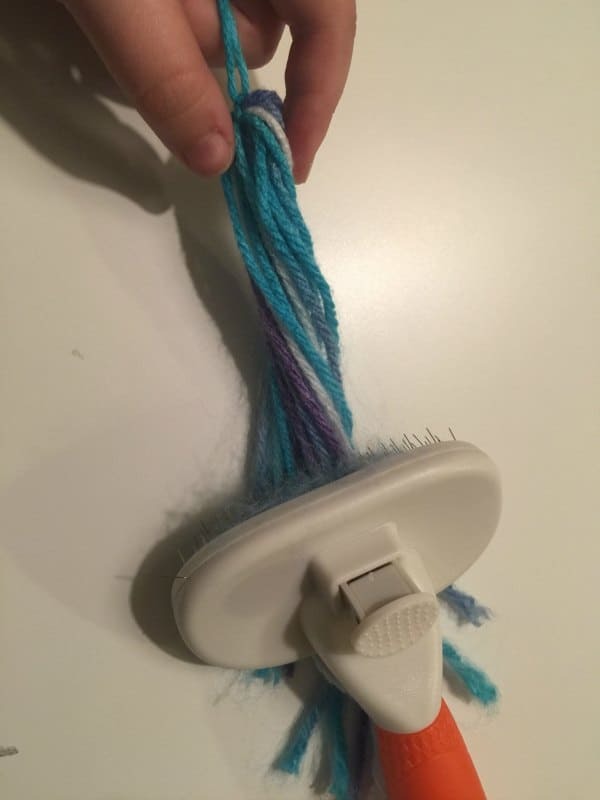 Once you’re finished brushing it, take the ends of the 5in piece that you had used to tie the yarn pieces together, and tie it around your yarn base at the bottom. Continue this process of making these fur pieces and attaching them to the tail base one at a time, from bottom to top. Make sure to alternate sides as well, that way the furry yarn will cover the braided tail base completely. Once you have furred to the top, you’re almost done! There are plenty of different ways to attach your yarn tail, but I like using these Key Chain Holders. All you have to do is either slip this through the top knot, or near the top of your braid, and tada! You are finished! You have successfully made your very own tail made completely out of yarn! Overall, this craft is extremely simple! However, it can be quite time consuming, so make sure you have the time to finish! Feel free to get creative as well! No need to stick to just one color! Here also, is our Costume Wolf Tail Tutorial! By Megan on September 26, 2017 Crafts. Would it work the same way if I just unraveled the yarn by hand? 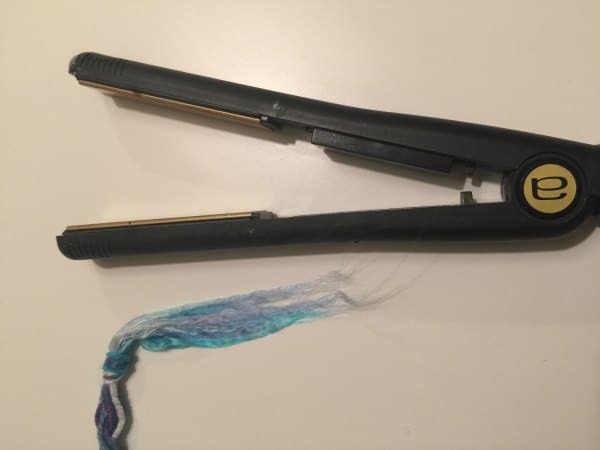 Unraveling the yarn by hand wouldn’t work as well as using a brush and straightener. The individual yarn strings will be curly and not-fur like by only unraveling. Can a normal hair brush work for this project? It’s not very helpful. I wouldn’t recommend it. Hey! I found that this is more helpful than the wolf tail one. I just want to know where you would get the binder clasps. I had a fun time making a really small one but it took 4eva!!! From two to five I worked non stop, except for a few snack foods, such as a kit kat… Or three… Anyway, fun project overall. You could do so much more with yarn now because you kno how to make it play howl-aween dress up like cotton candy! Anyway, great gift. How much yarn do you use? As much as u want for the size or length you want to make. I just bought two packs of yarn tho. I copied this really excellent comment from the Wolf Tail Tutorial because it might prove helpful if people find this one first. I personally think this one has a lot of great pictures and I recommend it! I’ve been slaving over mountains of fluff, trying to make nearly ten of these for friends as holiday gifts. It’s such an easy craft, but very time consuming and requires some trial and error. Here are a few of my discoveries, as well as a recap of some of the other commenters’ advice. 1) Type of yarn: 100% acrylic is pretty important when it comes to the flat iron stage. Polyester may melt, and wool may burn, but the acrylic yarn has a very fur-like texture when it’s done. 2) Fur texture: for coarse textured fur, use yarn that is marked medium. The thicker you go, the fluffier the tail will be. I prefer the bulky and extra bulky sizes, as it’s easier to brush out, but BUYER BEWARE: at least 1/3 of your yarn will end up in the brush. 3) Brush: the type of pet brush MATTERS. I used a dog brush with two sides. One side is a synthetic bristle hairbrush-style, the other is a natural, tightly grouped-style. Combining both of these yielded decent results, but I noticed significant flaws with that type. Use a brush like the one pictured: square/rectangular, with closely grouped metal spines that are relatively short. 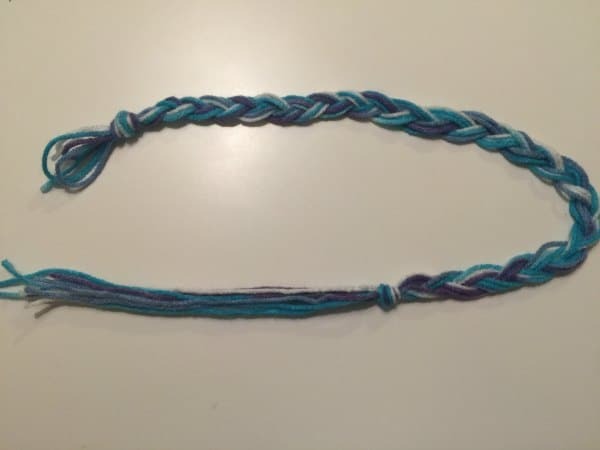 4) Base: the braided base can be made with any old yarn. It’s simply the point where you attach all of the fluff tufts. 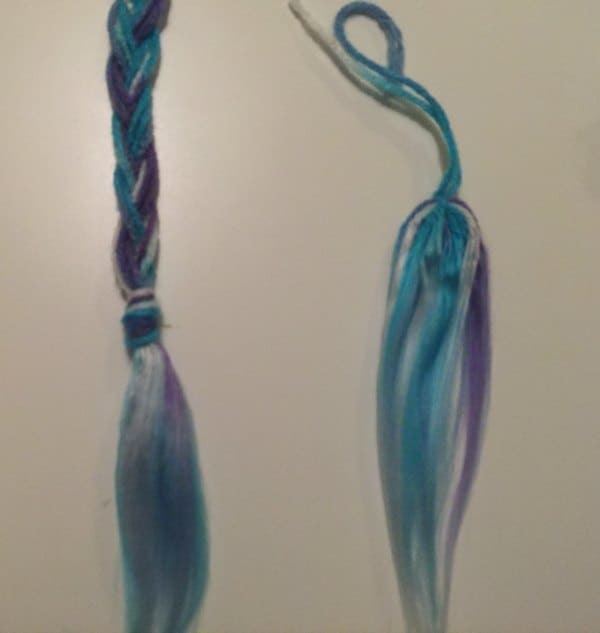 However, if you want to keep the loose ends at the bottom visible, you should use a color you want. 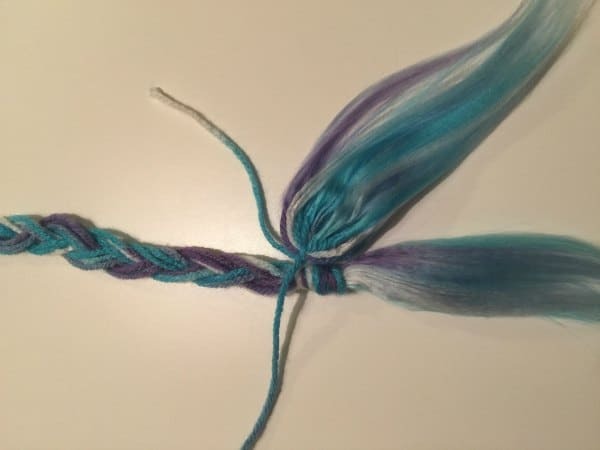 5) Tying the tufts: As you begin to tie on the tufts to the base braid, you may begin to notice unseemly gaps. 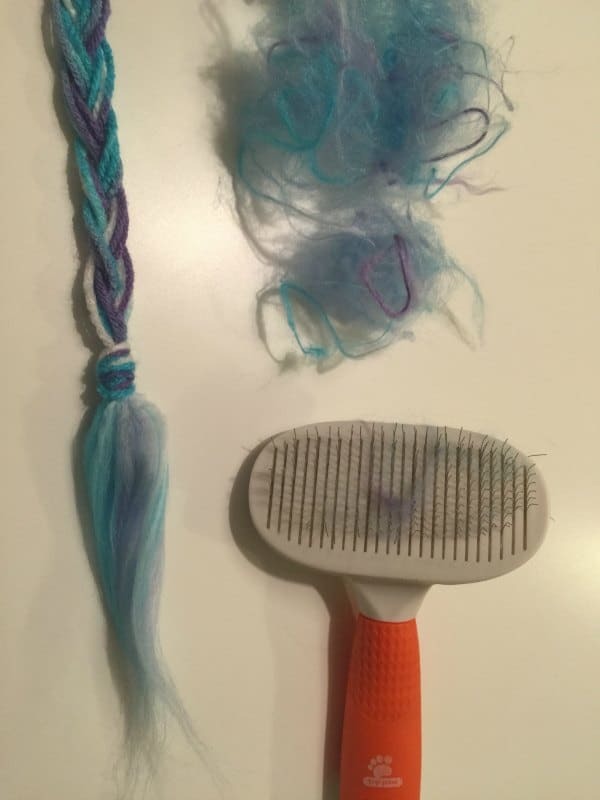 While brushing and layering the straightened tufts eliminates the more obscene gaps, the best way to avoid this is to alternate the sides where you’re laying on the hair. 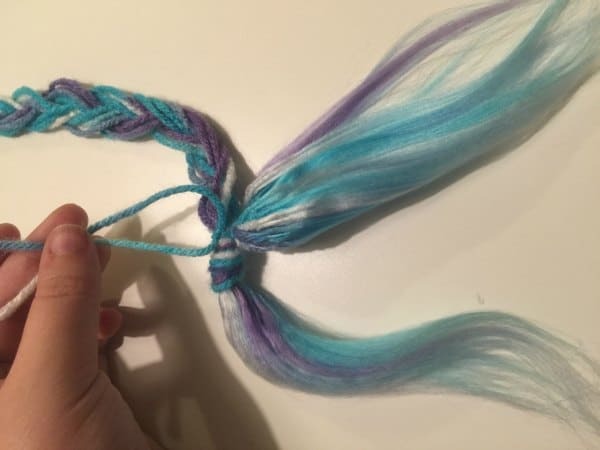 Tie one tuft on, and then flip the braid over and tie another tuft above that. This helps somewhat. 6) Finishing the top: if you find yourself a little confused with how to attach the tail once it’s complete, you can do what I did. 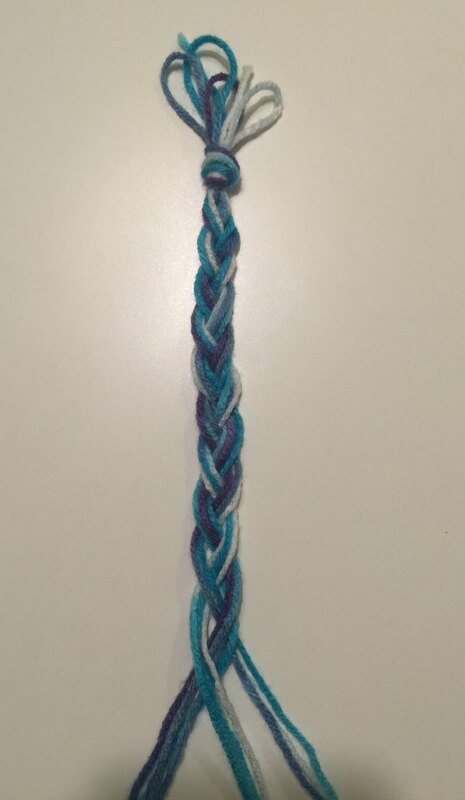 I either made the braid a little longer than I wanted the tail to be, and tied a loop at the top. 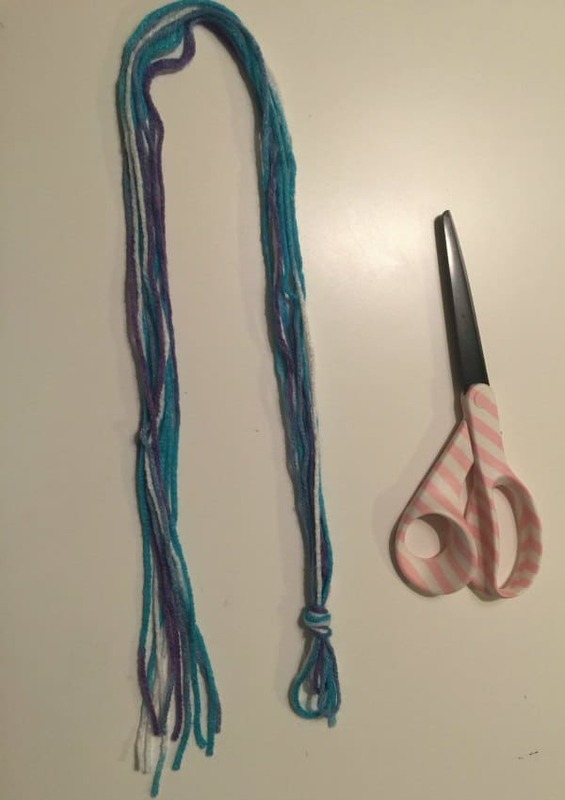 OR, you could leave the loose ends on the top a little longer, and form a smaller braid from just a few of these ends, say three or six, and tie it to your fastener. 7) Fasteners: You can use a lot of different fasteners and clasps for your tail. I prefer to use a simple safety pin that can fasten to anything, regardless of a loop. But if you want something a bit more durable, you can use index card rings, carabiners, or of course the ball chain and clasps recommended above. It’s a pretty adaptable purpose. You can definitely find creative ways to attach these tails. I hope this helps clear up some confusion. 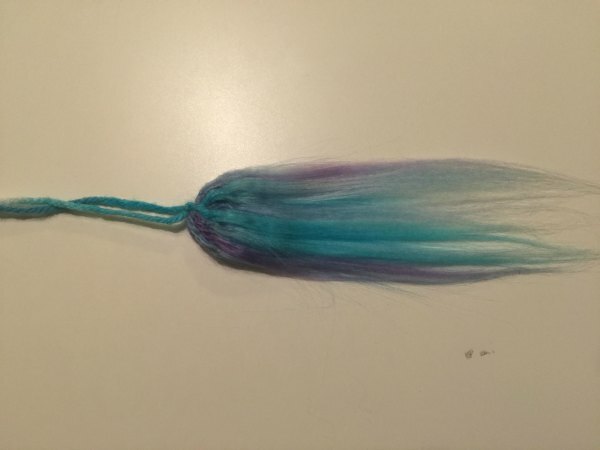 I would recommend making a miniature tail as practice, perhaps a key chain or doll tail, as a way of working out the little gremlins. You learn a lot just by doing. These tails are just like pancakes: the first one always goes a little wrong. If you have any questions, please reply and I’ll try to help out. Thanks Jennifer for this awesome tutorial. I had no idea how to do this before stumbling upon it. **Again, not my comment, just copying from the Wolf Tail Tutorial. Great tutorial! I love making yarn tails I am getting ready to work on my 7th one. 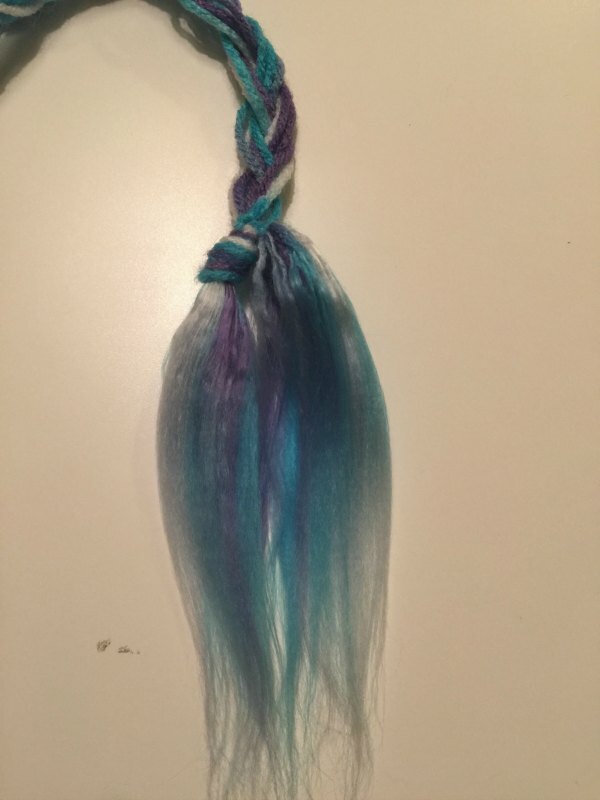 I wanted to make a wolf tail like the one on your wolf tail tutorial. Where did you get the yarn for it? I went to my local Hobby Lobby to get my yarn.